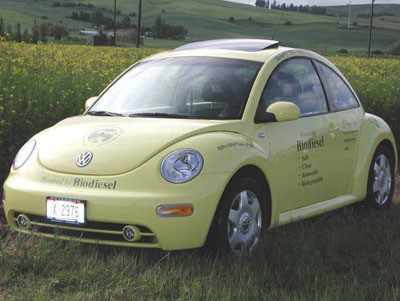 The “Mustard Bug” is not a pest, but a VW that runs on biodiesel made from mustard oil at the University of Idaho where they are researching mustard oil’s energy potential for biodiesel fuel. Mustard flowers. Photo: Riyaas; Wikimedia Commons. Mustard seed oil is not currently a common biodiesel feedstock, but because it has the potential to be a cheaper feedstock than the two most common oilseeds used for biodiesel (canola and soybeans), mustard oil biodiesel has been researched extensively at the University of Idaho. Mustard is related to canola, but mustard can grow in drier areas and needs fewer pesticides and other agricultural inputs than canola. Therefore, it can potentially be grown more cheaply. Mustard yields about 48 gallons of biodiesel per acre. The “Idaho Mustard Bug” parked in a field of mustard. University of Idaho for the dryland farming environments of northern Idaho and eastern Washington (Brown et al., 1998; Brown et al., 2004). 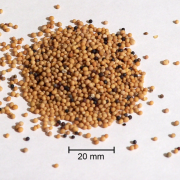 Compared to canola, mustard seeds have less oil, and that oil is somewhat harder to extract. Ida Gold has about 24% to 27% oil content, and Pacific Gold has about 34% to 38% oil content, compared to 40% to 45% for canola. Extraction efficiency with a small mechanical screw press was 58% for Ida Gold and 70% for Pacific Gold, compared to 78% to 80% for canola (Peterson and Thompson, 2005). Mustard oil biodiesel performed very well in vehicles. On-road testing with a 1999 Cummins 5.9L diesel engine in a Dodge pickup truck fueled with mustard biodiesel accumulated 56,465 miles with no difficulties. Fuel consumption increased compared to fossil diesel because biodiesel has slightly less energy per gallon than diesel fuel. The fuel filter had to be changed more often compared to what would normally be experienced with petroleum diesel. This may have been because the fuel filter material did not hold up well with biodiesel. On-road testing with a 2001 Volkswagen 1.9 L diesel engine accumulated 36,524 miles. Fuel consumption was about 46 miles per gallon of biodiesel (Peterson and Thompson, 2005). Mustard oil biodiesel performs well in cold weather, with a “cloud point” of 3.5°C and a “pour point” of -15°C (Peterson et al., 1997). The cloud point is the temperature of the fuel at which small, solid crystals can be observed as the fuel cools. These crystals will clog vehicle filters. The pour point refers to the lowest temperature at which there is movement of the fuel when the container is tipped. Because mustard biodiesel has a much lower cloud point and pour point than biodiesel made from animal fats or tropical oils like palm oil, mustard biodiesel is useful in cold climates. Mustard seeds. Photo: David Turner; Wikimedia Commons. mustard biodiesel can be blended with other fuels (such as canola or soy biodiesel) in order to meet the specification. One disadvantage of using mustard seeds as a feedstock for biodiesel is that the seed meal left over after oil extraction cannot be fed to livestock in large quantities. Many biodiesel producers sell edible seed meal as livestock feed. Mustard seed meal retains the hot mustard flavor and has a high concentration of glucosinolates, making it unfit as a concentrated source of feed. However, this same pungency adds value to the meal as a potential biopesticide. Mustard seed meal can be used to inhibit weeds and pests, which could make it valuable for the organic farming industry. Matt Morra at the University of Idaho is researching mustard seed meal as a biopesticide. 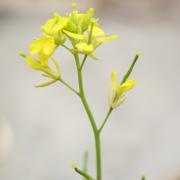 The University of Idaho Brassica breeding program is working on developing new mustard and canola varieties, including oilseed Brassica cultivars suitable for high-quality biodiesel. Brown, J., J.B. Davis, D.A. Brown, L. Seip, and T. Gosselin. (2004) Registration of ‘Pacific Gold’ Oriental Condiment Mustard. Crop Sci. 44:2271-2272. Brown, J., J.B. Davis, D.A. Erickson, A.P. Brown, and L. Seip. (1998) Registration of ‘IdaGold’ Yellow Mustard. Crop Sci. 1998 38:541. Peterson, Charles L., and Joseph Thompson. (2005) Biodiesel from Yellow Mustard Oil. National Institute for Advanced Transportation Technology, KLK311, NIATT Report Number N05-06. Peterson, C.L., D.L. Reece, B.L. Hammond, J. Thompson, and S.M. Beck. (1997) Processing, Characterization, and Performance of Eight Fuels from Lipids. Applied Engineering in Agriculture 13(1):71-79. Mustard Short bulletin on growing mustard commercially, published by University of Wisconsin Extension. Mustard Green Manures Washington State University publication on growing mustard as a cover crop. Seed Meals as a Biopesticide Information from University of Idaho on research using mustard and other rapeseed meals as biopesticides. Brassica Breeding and Research University of Idaho research on breeding mustard and canola.